Ideal for outdoor use on the go, the Blazer Venture torch lighter features stylish and lightweight design with dual wind resistant flames for toasting and lighting your favorite cigars. A large gas tank makes for more lights and fewer refills and an adjustable fuel dial allows for easy flame adjustment. I'm new to cigars and its accessories so I feel reviews on these items are important so that others can get an "honest" opinion of the items before purchase. I have saved myself some headaches from reading reviews in the past. So I figures I'd pass this along. So let me start by saying before you buy anything you need to first look at the company your buying from. Best cigar prices . Com as a company is fantastic. I kept a few of them on the phone maybe a little longer then we all expected but they have always given me great advice and more then solid recommendations. Now on to the lighter. I have some some research and let my homework be your shortcut. I was very excited to receive my lighter in the mail (2 days later) with extremely fast shipping. When I opened the lighter and clicked it on for the first time it lit for a second then went out. I tried again and same thing. Come to my surprise the lighter arrived with no fuel or very little. So then I went to the store to buy butane fuel. (Buy zippo fuel or something that is of high quality, I have learned it makes a difference). After I filled it up you need to let it sit. The butane from the can to the lighter is extremely cold. So you fill the lighter, let it wait a bit for the gas to warm up and expand then BAM! It was working! I'm not sure if there are shipping laws that make you ship the lighter empty. But after I filled it up it's great. It works the SAME as lighters more then twice the amount. Believe me this lighter feels great and looks the same! Nothing cheap about it. Only downside is there is no clear part to see butane level. So your not going to know when your almost out. If this lighter had a clear view to the tank I would say it's perfect. That's the ONLY thing that would make this lighter better. I would buy it again and recommend it to a friend. Purchase it and enjoy! 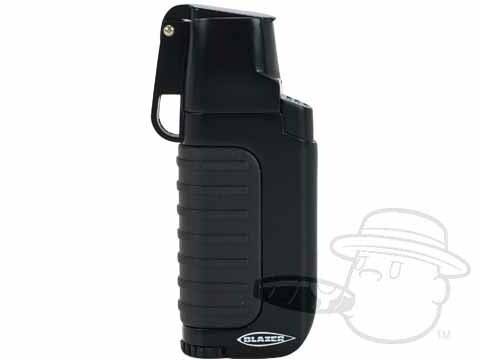 Blazer Venture Torch Lighter - Black is rated 4.8 out of 5 based on 2 customer ratings. You can use any filtered butane with this lighter. We sell it right here, at BestCigarPrices.com if you search "butane" you'll be able to pull up our sales on this!